I have created a new photo gallery which contains photos of different wood, stone and brick textures that I have come across over the years. These would serve as good backgrounds for web sites, electronic communications and printed materials. These images are found in the "Backgrounds / Wallpaper" photo gallery. A large number of new calf photos have been added to the top of the "Cattle - Calves 2" photo gallery. I had a wonderful opportunity to photograph red and black angus cows at sunset on a mild winter day. I enjoyed being in the company of these good looking heifers, which will be calving in about 2-3 months time. Clear air, rich light and cooperative animals made for a great photo experience. These photos can be found in my "Cattle - Winter 2" photo gallery. In my travels in Wyoming and Montana in mid-late September I came across some vibrant fall colors at several locations. These Autumn photos can be found in my Landscape "2" Gallery. I had several opportunities this fall to photograph lovely agricultural landscapes while traveling in Montana and southern Alberta. These images can be found in my Agriculture / Country Scenics "2" photo gallery. This gallery also contains photos taken of barns and silos in southern Ontario in the spring. New photos have been added to my Feedlot 2 gallery from my travels in Iowa and Montana. I have over 2500 new edited photos that I am currently processing. New images will be uploaded to my website over the coming weeks and months. These new photos were taken during the period from January to August of this year. 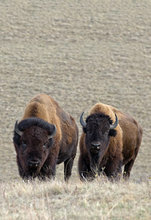 New bison photos are now up on my website and I am currently working on expanding my livestock Bull Gallery. I added a new digital camera (a Canon EOS 5D Mark IV) to my equipment bag earlier this year and am quite impressed with the results. Had a number of wonderful opportunities to photograph beef cattle in Montana in late April. Photos from this trip can be found at the beginning of Calves 2 and Cows and Calves 2 photo galleries. I had the good fortune to revisit a herd of 2 year old, bred, black and red angus heifers in a winter enclosure. These cows were hanging around while waiting for the feed wagon to come and were quite curious about me. Just days earlier the weather had dipped down to -35 Celsius (with windchill, it was -50 Celsius). The owner mentioned that the frigid conditions were hard on the cows but all had survived the cold. 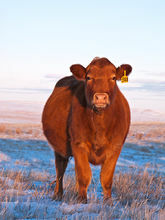 I am currently processing photos of cattle on fall and winter pastures in southern Alberta. Good moisture in the spring and early summer produced amazing grass and wild flower growth on native rangelands. The absence of rain from July to September caused grasslands to quickly wither and dry up. My sons and I headed down to Flathead Lake for the labour day long weekend. Smoke haze at Lakeside did not diminish our interest in ripping around this large lake on the Sea Doo. The absence of wind on the lake for most of the afternoon made for good skiing. Photos from this trip reveal that the machine was often driven at full throttle (up to 55 mph). Wonderful water spray patterns are featured in a number of the photos from this trip (see the Gallery: Water Sports). I had some terrific opportunities to photograph bison calves this spring. I went back several times because I just love being around these magnificent animals. Good spring moisture and and excellent ground conditions produced a wildflower array like I have never seen on bison grasslands before. And the calves were in fine form playing amidst all the beauty. Interspersed throughout my bison gallery are landscape photos of the bison paddock at Waterton Lakes National Park. As you will see, this is a lovely place indeed. I have created a new Gallery that contains photos of yearling calves. While photographing cows and calves at sunrise, I came across this lovely scene: a calf's attention was caught by a pheasant that was strolling by. The pheasant walked in front of the calf and then promptly flew off into the shrub habitat behind the calf. The rising sun hit this spot just a few minutes later. What are responsive images? Traditionally when an image is embedded in a webpage, there’s just one image file and the browser loads it. With responsive images, for each photo several different image sizes are provided, and the browser will automatically choose the best one to load based on a variety of factors including browser size, screen resolution, and internet connection speed. The responsive images feature has two major benefits: it provides higher resolution image files for large monitors and retina screens, and conversely it supplies lower resolution image files for small devices that don’t need to load a big image file. In the past I uploaded photos that were 700 pixels wide; photos that are now being uploaded are 1200 pixels wide. I needed to start a new photo gallery showing beef cattle in feedyards. These feedlot photos are found in my Cattle - feedlot 2 gallery. I went out to photograph wildlife on the last day of December 2016 but while driving around I discovered some amazing snowdrifts along a lonely country road. I used a telephoto lens to capture the beautiful intricate and delicate snow formations before rapidly approaching clouds would obscure the sun. I was fortunate that the snowdrifts were beside a pasture (not a summerfallow crop field) which provided a clean snow surface. My collection of snowdrift photos is found in my new Snow photo gallery. Please visit my Wall Hangings / Prints photo gallery to see what wall hangings and prints of my snowdrift photos look like with a black border. On a glorious fall day in 2007 I spent a couple hours with a small herd of young cows on a native prairie pasture. The heifers came over to check me out. Eventually I sat down on the prairie and just enjoyed the company of the cattle at close quarters. This occassion resulted in a number of fine images with my first digital camera. Late fall proves to be a good time of year to photograph bulls. This year I had a number of opportunities to photograph simmental, red angus, charolais, and hereford bulls. Having cooperative animals sure makes a difference. Check out my latest bull photos at the beginning of my Cattle - Bulls gallery. 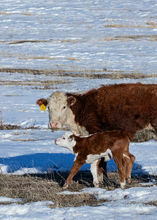 An assortment of fall calf photos have been included in my Cattle - Calves 2 gallery. I have been spending time with my mom in the kitchen during the last several years to learn how to bake our family's favorite baked goods. Recently my brother Norm and I spent 3 hours with mom learning how to make Streuselkuchen and Rhubarb Kuchen. Check out my Baking and Belts gallery to see photos of how I prepare some of my family's cherished baking recipes. While heading out to photograph cattle early in the morning on several ocassions I came across horse scenes that begged to be photographed. 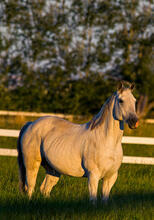 Horses that are photographed during the "golden hour" have a wonderful rich quality to them. These photos are found on the first page of my Horse gallery. I decided that a trip to the mountains would nourish my soul. I needed a break from photographing bovines. So I ventured up to the Icefields Parkway -- some have declared that it is the most beautiful roadway in all the world. The parkway is situated between Lake Louise and Jasper, within Banff and Jasper National Parks. I spent 4 days relishing the beauty of this mountain landscape, and became fascinated with the many glaciers that are visible from the roadway. Moraine Lake, Peyto Lake and Mount Edith Cavell were particulary impressive (I arrived early in the day at each of these locations while hardly anyone else was around). I'm going back again next spring! This was a terrific experience. I was able to spend over an hour with a grizzly bear one evening. Photos from this trip are in my new Mountains and Glaciers photo Gallery. It has been a wonderful spring to photograph beef calves. Mild weather and good moisture is the story this spring in southern Alberta. I have now completed a number of trips to photograph calves and have thoroughly enjoyed myself. 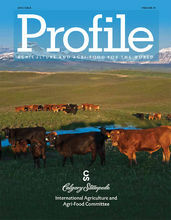 I was pleased that my photo was selected by the Calgary Stampede International Agriculture and Agri-Food Committee as the cover image for the 2016 edition of PROFILE magazine (which showcases Alberta agriculture, the agri-food industry and the Calgary Stampede to the world). The magazine receives international distribution and is made available at all major American and International stock shows, through international agricultural associations, and at selected embassies and consulates. I made two custom axe sheaths for my Scandanavian woodsman axe. Several photos of the new axe sheath can be found in my Baking and Belts Photo Gallery. I used a Bison concho snap and made a tooled leather strap to give the sheath a decorative and attractive appearance. I also developed 2 small brands and branded my initials into the sheath. I will now be making a custom sheath for my Hudson's Bay axe. Please contact me if you are interested in having a custom sheath made for your favorite axe. Four days of superb weather fell around New Years Day 2016. I went out with my camera gear to photograph cattle on their winter pasture and had a most enjoyable experience. Wildlife was everywhere present, and this provided me with some wonderful opportunities to photograph mule deer and white-tailed deer as well. I have visited the Majorville landscape in southern Alberta over a period of several years. The Majorville Cairn and Medicine Wheel is the noteworthy (provincially significant) feature that is found here. 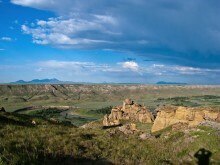 The prairies and the Bow River valley are attractive surrounding landscapes. Many new photos have been added to the gallery Cattle - Winter. Excellent weather produced some wonderful photos of cows in their heavy winter jackets. I have been spending time photographying cattle bulls on fall pastures. A benefit to photographing bulls at this time of year is there are fewer flies on the animals. And they are putting on their winter coats to give them a healthier look. In my photography travels I have come across many scenic agricultural landscapes. Where I live, in Southern Alberta, we have a variety of farm and ranch landscapes. If you would like to see some recent photos of the southern Alberta country side, please visit my "Agriculture / Country Scenics" gallery. It's been several years since I purchased a new camera. I spent a few hours getting familiar with the camera and looking through the Owners Manual and then went out to photograph cattle on spring pastures. All in all I was quite impressed with the lens, sensor and the camera's capabilities. This camera effectively replaces 3 cameras that I normally work with in the field. Unfortunatley, the new camera's RW2 files are not compatible with the software that I currently use so I had to adopt a new (more cumbersome) method for downloading and processing the new RAW files. I have created a new Cattle - Winter gallery which contains photos of cattle on snow covered rangelands. Photos taken while vacationing on the Oregon Coast in the summer of 2014 have now been uploaded to the Travel and Adventure Gallery. Some choice photos, scanned from slide transparencies, have been added to a number of cattle Galleries. These photos will have the word "Scan" included in the photo ID number. Bison have always been fascinating animals to me. I am captivated by the rugged beauty of these majestic creatures. But these shaggy beasts are challenging to photograph. I had a good opportunity to photograph a herd recently and have added a number of images to my Wildlife gallery. I took my 2 sons fly fishing in Montana in late August. We started on the lower Dearborn River, then moved on to the Missouri River downstream of Craig. From there we went further south to fish the Madison and Gallatin Rivers. Heavy rainfall the previous week had put a lot of silt in the upper Yellowstone River, which resulted in a drive through Yellowstone National Park and more time on the Gallatin River. We enjoyed three days of terrific scenery on Montana's premier blue ribbon trout streams and one day of relaxation around Bozeman. Looking forward to coming back in 2015. See photos from this trip in the Fly Fishing 2014 Gallery. While driving the backroads along the Rocky Mountain Front Ranges, looking for cattle to photograph, I occassionally come across some good opportunities to photograph horses. I love walking up to a fenceline and watching these magnificient creatures. Often they walk right over to check me out. Lots of new horse photos have been added to my Horse Gallery during the last 3 months. I had 2 wonderful photo trips in Montana photographing cows and calves in May. Late season snows gave the Rocky Mountains a resplendent beauty. Mild spring weather and bright sunshine had begun to turn brown pasturelands and native rangelands into a lush green color. Young black calves were playfully bouncing around everywhere. The last of winter feeding on home pastures was coming to an end. This all presented some great photo opportunities. I look forward to returning next spring. I am now processing cattle photos taken in 2009 (which was the year in which I started using with my first digital SLR camera). It is most enjoyable to get re-acquainted with images that were taken 5 years ago. I am surprised at how many details I can remember when processing individual photos. It stirs up lots of good memories of being in the field. I am looking forward to doing a multi-day photo shoot in Montana in late April: spring calves, fly fishing, scenics and whatever else comes up. I had a wonderful opportunity to photograph black angus cows on a winter pasture in southern Alberta. I arrived on the scene several minutes before the sun disappeared behind the Rocky Mountains. Some animals were engaged in swath feeding, others were grazing on tame pasturelands. These photos can be found in the Cattle - Herd gallery and the Cattle - Cows gallery. The animals were cooperative and the air temperature was good for handling my camera without gloves. I have a collection of over 100 weathered wood photos. These can be found in the Other / Assorted gallery. 80 new livestock images have been added to the Cattle: Special Light / Artistic gallery. These high dynamic range (HDR) photos were taken several years ago. HDR images (look for "HDR" in the photo ID) are made by blending three consecutive photos, each having a different exposure value. The blended final image contains more vivid colors than conventional images, and sometimes look more like an illustration than a photo. Taking HDR photos of moving subjects like cattle is quite challenging. Occassionally you will see cattle movement and software interpretation artifacts in the final image. After a month of editing (in my spare time) over 2000 fly fishing photos and digitally processing the "keepers", my new fly fishing Gallery has been launched. It enjoyed spending time with my 2 sons at several different trout bearing rivers and in putting this photo collection together. Caption information will eventually indicate the names of the rivers being fished in Alberta, Montana and Wyoming (during the months of July and August in 2013). Photos in the Fly Fishing Gallery have been sized to 1100 pixels in width (rather than 700 pixels, which is the common photo size found in my other Galleries). I have also decided to add © watermarks because of the larger image size. I was out photographing cattle on prairie rangelands throughout the summer months (as a result, many new cattle photos will be uploaded to my website on a regular basis). Some good opportunities to photograph wildlife in prairie habitats also presented themselves. This summer I decided to photograph an entirely new subject matter. This has proved to be a most exciting endeavour, which allows me to spend time with my 2 adult sons. Watch for a new online Gallery coming early this fall. New head shots of horses were added to the Horse Gallery. These photos were taken of ranch horses in the fall of 2010. 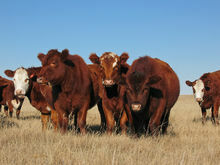 In August of 2010 I was able to photograph Beefbooster cattle. The Canadian Cattlemen's Association says the following about Beefbooster: "In the last 35 years, Beefbooster Inc has developed a leading beef breeding program in Alberta. To date the focus of the program has been to establish specific lines of beef cattle to exploit the benefits of cross-breeding (heterosis or hybrid vigour) for the delivery of cattle tailored to Western Canadian environments and production systems. Beefbooster is a fine blend of application of sophisticated statistical methodology with practical animal breeding and production. Emerging technologies, such as genomics provides a new opportunity for beef producers to address traits and attributes demanded by consumers, retailers, and feeders that better fit market specifications and improve competitiveness of current cattle supplies. The application of DNA technology could allow leading meat companies to better manage variability and hence deliver attributes to better meet the changing demands of the customer. Genetic markers allow for the selection of traits that are hard to measure and traits that are lowly heritable." Most of the Beefbooster photos are found in the Cows Gallery and Cows and Calves Gallery. I had the good fortune to photograph cattle under superb morning light on rangelands that had beautifully greened up by early summer. You will see photos like the one to left in the Cattle - Cows and Cattle - Bulls and Cows galleries. These photos (along with many other recently uploaded images) were taken in 2010. 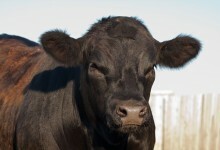 Black angus photos have been added to several cattle galleries. Cooperative animals under good light produced some nice results. I came across this wonderful scene while driving in Alberta's foothills on a gorgeous winter morning. Black angus cattle were spread out on a snow covered hill side. When the tractor bringing round hay bales showed up, the cattle quickly moved to their feeding area. You will find most of these photos from this photo shoot in the Cattle - Herd gallery. February 9, 2013: Check out these Angus beauties! I had a great opportunity to photograph some exceptional black and red angus heifers on a winter pasture under bright sunshine. These cattle performed well for the camera without any assistance. Find these beauties in the Cattle - Cow and the Cattle - Herd galleries. I have created a new Gallery (Cowboys / Ranches / Rodeos / Western) which is centered around cowboys and our "western" heritage. Uploaded photos showcase round-up and branding time at a large ranch. I also included photos that were taken at a "working cowboy" rodeo at the historic Bar U Ranch. I have uploaded new cattle head shots in the Cattle - Portrait gallery and more cattle pen shots in the Cattle - Feedlot gallery. I have uploaded more photos in the Cattle: special light / artistic gallery. Over 300 new photos were added to the Cattle - feedlot gallery. I was able to photograph Charolais cows and calves on a recent photo shoot. I attempted several panoramas, which are featured in the new gallery: Cattle - panoramas. Above seasonal precipitation levels (during the spring and early summer months) resulted in good prairie green-up conditions in the central and eastern portions of the Milk River basin this year. I was able to photograph the Milk River canyon just after it reached its prime. New photos from this photo shoot are found in the Landscape gallery and Panorama gallery. You can see my shadow in the photo to the left as I photographed across the Milk River valley toward the Sweetgrass Hills (East, Center and West Buttes), which are located in northern Montana. A few days later I was able to photograph mule deer bucks, does and fawns at sunrise on the Milk River Ridge (see Wildlife gallery). I have called my photography business Last Light Photography but I generally take more photos at "first" light than I do at "last" light. Check out my sunrise cow images, which have been added to the Cattle: special light / artistic gallery. I just finished digitally processing images from a recent spring photo shoot along the Rocky Mountain front at Augusta, Montana. This is real pretty country! I did the same trip last year and decided then that I needed to come back. Most of my time was spent on quiet country back roads, in prime ranch country, looking for livestock to photograph. I enjoyed great light displays at sunrise on this particular trip. I explored the Sun River Wildlife Management Area and spent some time relaxing at Wolf Creek – where you will find a wonderful slow drive along the Missouri River. While driving down to Augusta I travelled through the Blackfeet Indian Reservation, where I came across some beautifully colored paint horses (photos are found in my Horse gallery). Welcome to the online photo galleries of Sam Wirzba. I hope you enjoy my new website! Finally, the day has come to activate my website. I first entertained the idea of having a personal website in December of 2009. The desire to proceed grew and intensified over the intervening months. During the summer of 2011 it became a personal quest. Considerable time and effort went into the selection and preparation of photos for the various online galleries over the last 8-month period, and in learning how to use ACR and Photoshop for digitally processing photos. As I began my research to find a web developer, I came across Jack Brauer’s website and was captivated by the beauty of his landscape images from around the world. While visiting the websites of other highly regarded landscape photographers, I noticed that a number of them had their sites prepared by WideRange Galleries – which is owned and run by Jack Brauer. After reviewing the WideRange Gallery website, I was impressed with what was being offered in terms of features and functionality and decided that Jack’s customized website development services where ideally suited to my needs. I first contacted Jack in December 2011 and then, in April 2012, commenced with the development of this website. I would like to thank Jack Brauer for the development of this website, which allows me to add, modify and delete photos and content with ease – whenever I please. I owe a lot to my youngest son Brent (now commencing with his second degree in electrical engineering at the University of Toronto) for the significant contribution that he has made to my photography work. He has been my IT specialist for several years, resolving many hardware and software issues, giving me tutorials to assist me in my work, creating photo directories, converting my images into web-based photos, and assisting me with many other tasks too numerous to mention. And I want to thank Matthew, my oldest son (who prepares and sells satellite imagery) for his recent involvement in Last Light Photography, providing advice, undertaking reviews and for working with me in the area of marketing. Who knows, some day one of my sons may take up a camera and join me in the field. Together, the 3 of us have had many wonderful experiences in Alberta’s wild places. Matt and Brent have been most agreeable subjects in numerous photos that I have taken of our backcountry adventures. This website, and my photography business, are intended to give honor and glory to God through Jesus Christ, who has made the amazing things which I love to photograph, whose providential care I enjoy on a daily basis, and who has endowed me with whatever artistic talent and photography skills that I possess. I was once asked if God has any interest in cows. Shortly thereafter I came across this verse in the Old Testament (Jonah 4:11) - But God said to Jonah . . . “And should not I pity Nineveh, that great city, in which there are more than 120,000 persons who do not know their right hand from the left, and also much cattle?” More recently I read in Psalm 104:14 - "You [God] cause grass to grow for the livestock . . ."
I am thrilled that my website is now, at long last, going live. But there is more work for me to do. After a few days rest, I will proceed with digitally processing several thousand images from my photo collection – which will incrementally find there way into my online galleries. I have finally decided that I would do what other serious photographers do – launch my own website to showcase my photography portfolio online. You will quickly notice that I am an agricultural photographer who specializes in cattle imagery, but I occasionally point my cameras at other subjects as well (a list identifying the range of subjects that I photograph can be found here). I have been photographing livestock since 2004. I still enjoy it. And I take it seriously, constantly striving to produce visually arresting, high quality images. At this website (once all of my Galleries are fully populated) you will find the largest selection of cattle photos in North America. Cattle are photographed under natural light conditions, in their natural setting, in Canada and the United States. Occasionally I produce images that have a more artistic look to them (see the “Cattle – special light/artistic” photo gallery). Old and new photos will now be made available online. Through this website I am providing “superior” quality images. All photos have been digitally processed from RAW files, which are then converted into high-resolution TIFF files, and then saved as JPEGs for online viewing. All images on this website have been color corrected and enhanced using Adobe Camera Raw and Photoshop. PLEASE NOTE: For clients who have received photo CDs from me in the past, the online images in my photo Galleries will supersede and replace images that were provided to you in photo CDs. My aim for the website is to initially present my photographic output for the year 2011 as well as new images that were acquired in 2012. I will then (in the months to come) be populating the Galleries with photos from the years 2010, 2009, 2008 and 2007 (in that order). I have many terrific images that will be going online so it will be worth your while to check back from time to time and see what has been added to the various Galleries. For anyone who may be interested in my earlier agriculture photos that were captured on film (i.e., slide transparencies), these can be viewed at AgStock Images. All material © copyright by Sam Wirzba. All rights reserved. Site by WideRange Galleries.